Posted May 31, 2016 by - filed under Waterproofing. The difference between a vapor barrier and encapsulation in a crawl space is thickness, flexibility, and a sealed interior. As you may know, moisture can cause a whole host of problems by condensing on cold surfaces such as ductwork at wood, leading to rot, mold, and mildew growth. 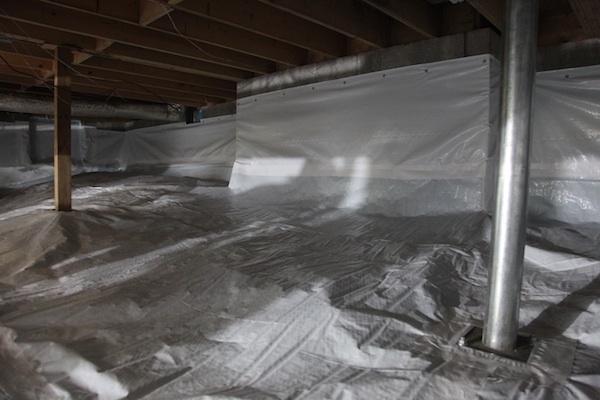 A vapor barrier reduces the chances for ground water to evaporate in the crawl space. A thin sheet of black (typically) plastic, usually 4 to 6 mil thick, is spread across the crawl space floor and is overlapped at the seams. However, the vapor barrier is not a sealed system. It typically stops short of the walls and columns. Because vapor barriers are not sealed systems, moisture can bypass the vapor barrier and get into the crawl space. As such, it’s not a perfect solution to water evaporation under your home. A better option is a process called encapsulation, which is usually done once water management has been completed in the crawl space. In this process, all vents, holes, cracks and areas where air can penetrate are sealed in the crawl space. A thicker plastic lining between 12 mil and 20 mil thick. It has a polyester-cored reinforcement, which is much more durable. More importantly, all the seams are sealed and and the liner is mechanically fastened to the walls and the columns, which creates an encapsulated crawlspace.